West Columbia Texas, formerly Columbia, First Capital of The Republic of Texas. 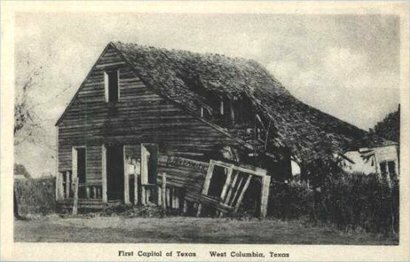 In September 1836 Columbia, now known as West Columbia, became capital of the Republic of Texas. This took place with the removal of the ad interim government here from Velasco. After the election called by ad interim President David G. Burnet, the first permanent government of the Republic went into operation here in Columbia in October. Inaugurated were President Sam Houston and Vice-President Mirabeau B. Lamar. Under their leadership the first duly elected Congress convened and the first Constitution of the Republic was ratified. Citizens of this vicinity served the Republic. Henry Smith of nearby Brazoria prior of this time has been the first Anglo-American governor of Texas, in the 1835-36 Revolutionary provisional government. In President Houston's cabinet he was secretary of the treasury. Stephen F. Austin, colonizer and Father of Texas, was secretary of state; under the heavy demands of that office, his health broke and he died here on December 27, 1836. In April 1837 at the wish of President Houston, the seat of government was moved to more adequate quarters in the city of Houston. About 1833 Leman Kelsey built a story-and-a-half calpboard structure near this location. 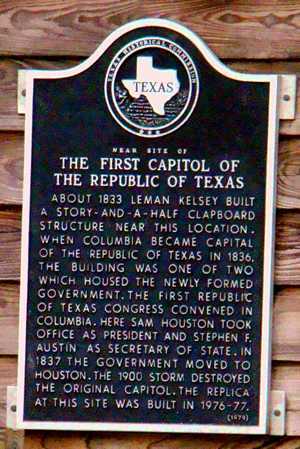 When Columbia became capital of the Republic of Texas in 1836. The building was one of two which housed the newly formed government. The First Republic of Texas Congress convened in Columbia. Here Sam Houston took office as Secretary of State. In 1837 the government moved to Houston. 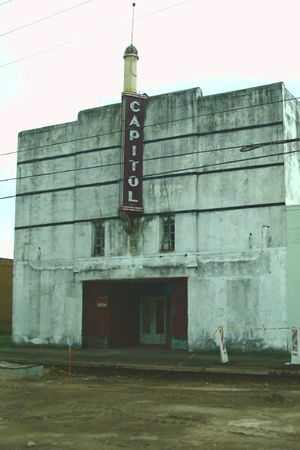 The 1900 storm destroyed the original capitol. The Replica at this site was built in 1976-72. Thanks to a developer抯 donation of a 337- by 35-foot strip of land along State Highway 35, the historic spot has been transformed into Capitol of Texas Park. Dedicated on April 17, 2009, the park features a path connecting a series of granite monuments telling the history of the area. 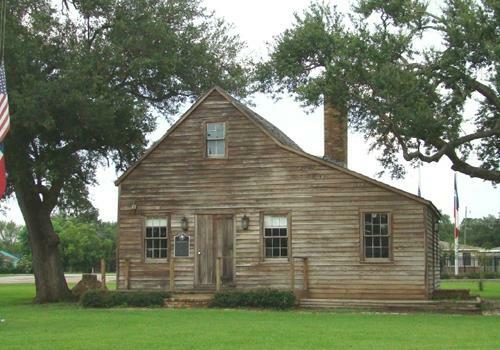 That history goes back to 1824, when Josiah Bell settled on the nearby Brazos River at a point soon known as Bell抯 Landing. 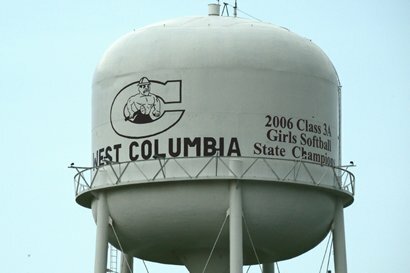 A community at first called Marion and then East Columbia eventually merged with the nearby settlement of Columbia, later renamed West Columbia. Since by the summer of 1836 Columbia had more buildings than any other Texas town, not to mention two newspapers, the interim government of the Republic of Texas decided it would be the capital city. The nation抯 business was done in several frame structures put up a few years earlier. The House of Representatives met in a one-and-a-half story structure built in 1833 previously occupied by a merchant named Leman Kelsey. Across the road from the House, the Senate conducted its august proceedings in a two-story store formerly used by the firm of White and Knight. 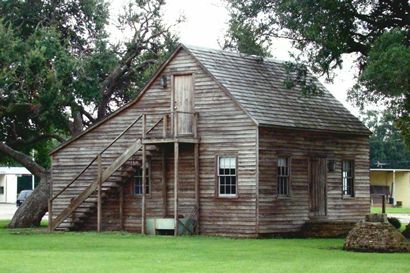 The First Congress convened in those two buildings Oct. 3, 1836 and worked through December, when the government removed itself to the new town of Houston. The rented government buildings reverted to private use, the structure that had accommodated the republic抯 upper house being torn down in 1888. The former lower chamber survived beyond that, but it had deteriorated considerably. In 1897, a Houston photographer named F.E. 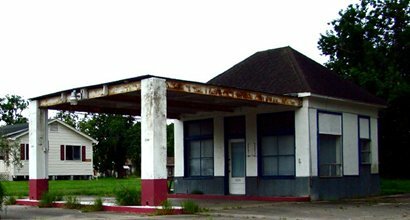 Beach took a picture of the old structure � a gaping hole in its roof � and labeled it 揊irst Capitol of Texas.� He sold cardboard-mounted copies for 25 cents. 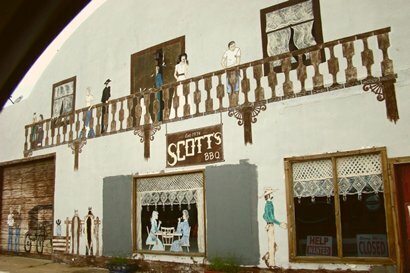 The Daughters of the Republic of Texas, saviors of the Alamo, had their collective sights on the old building when the September 1900 Galveston hurricane destroyed it. Fortunately, Beach抯 image and several other photographs survived. In 1932, the DRT placed a granite historical marker at the site. Seven years after that, the area was cleared and a series of businesses went up along the street. Those structures were razed in 2007 to make way for a new chain drug store. When the existing pavement was ripped up, workers discovered an old cistern and assorted artifacts. Boyd抯 firm got hired to do an archeological survey.